I regularly make the statement that every human body is different. This is because, well, every human body is different. We all require curated diets specific to our bodily sensitivities and lifestyle habits. This truth is never more relatable than when it comes to premenstrual syndrome or PMS. With that said, while we may all be different, there are certain plant-based products that may help all of us in the same way. This seems to be the case with magnesium. Magnesium is an incredibly important player in biochemical reactions throughout the body. It helps create energy, forms proteins, spurs muscle movements, maintains genes, and regulates the nervous system, to name just a few of its duties. Yet, as I researched magnesium correlating with women specifically, I found that it is a hugely important component for combating the symptoms of PMS. Women who don’t have enough magnesium oftentimes experience aggravated premenstrual syndrome symptoms including more painful cramps, dramatic mood swings, higher levels of irritability, and elevated migraines. Yet, research also shows that women aren’t getting enough magnesium in their diets. Why is magnesium lacking in women’s diets and how can we get more? Let’s take a deep dive into magnesium and premenstrual syndrome! Magnesium is one of the major minerals, which means that “higher amounts are needed compared to trace minerals, like zinc or iron.” This major mineral works in tandem with the 300 plus enzymes that “help to regulate many bodily functions, including the production of energy, body protein and muscle contractions,” healthy bones, and healthy heart function. Yet, magnesium isn’t just for supporting an already healthy body, but can also be a way to manage and treat many bodily ailments. Magnesium-rich food and magnesium supplements have been used to manage chest pain, high blood pressure, irregular heartbeat, high levels of low-density lipoprotein (LDL), also called “bad” cholesterol, and low levels of high-density lipoprotein (HDL), also called “good” cholesterol, fibromyalgia, cystic fibrosis, Lyme disease, osteoporosis, and chronic fatigue syndrome (CFS). On top of that, magnesium has been shown to have positive effects on attention deficit-hyperactivity disorder (ADHD), anxiety and depression, alcoholism, mania, leg cramps (especially at night and during pregnancy), migraine headaches, and premenstrual syndrome (PMS). And these are just a few of the many positive benefits and uses of magnesium! The recommended daily intake of magnesium is dependent on gender, age, and if you’re pregnant. Women “who are 19 years and older (and not pregnant) need 310 to 320 milligrams (mg) daily; whereas males of the same age should strive for 400 to 420 mg per day,” and pregnant women in the same age range should aim for 350 milligrams per day. If you’re a woman over the age of eighteen, then you’ve most likely experienced some form of premenstrual syndrome. Yet, how well do we understand what is going on during this time? If you’re like me, I’m still going off of the general overview from my high school health class. Menstruation begins after ovulation, during a phase called the luteal phase. The luteal phase is accompanied by a dramatic shift in hormone levels, as well as the more unsavory aspects of the menstrual cycle. The symptoms of PMS range in severity and type depending on the woman’s body, diet, age, and medical intervention, such as birth control. These symptoms include “mood swings, tender breasts, food cravings, fatigue, irritability and depression,” bloating and weight gain due to water retention, uterine cramping, headaches or migraines, acne, digestive discomfort, joint and muscle pain, concentration issues, crying spells, and even night sweats and social withdrawal. What I was most surprised by was the fact that researchers hadn’t yet pinpointed the exact cause of PMS. With that said, there are a few conjectures. Hormones play a significant role. Cyclic changes in hormones that take place during your menstrual cycle may be spurring those emotional symptoms such as anxiety, crying spells, and irritability. During your menstrual cycle, there are also chemical changes in the brain, specifically fluctuations of serotonin. Serotonin is a neurotransmitter “that’s thought to play a crucial role in mood states,” and is believed to trigger PMS symptoms. Other researchers believe that women who already suffer from a form of depression may experience aggravated PMS symptoms. How does magnesium fit into the premenstrual syndrome picture? In December 2010, the Nursing and Midwifery Care and Research Center at the Isfahan University of Medical Sciences in Iran, performed a study over four months to find out the efficacy of magnesium in alleviating premenstrual syndrome. Participants were divided into three groups: one received a placebo, one received magnesium, and one received a cocktail of magnesium and vitamin B6. Results discovered that those participants that received either just magnesium or the magnesium-vitamin B6 cocktail experienced a significant decrease in PMS symptoms. Obviously, magnesium plays an important role in regulating premenstrual syndrome, yet researchers are still trying to figure out the mechanism between the two. With all the circulating studies drawing a link between magnesium intake and decreased PMS symptoms, why aren’t we seeing an alleviation of symptoms across the board? Two reasons: every human body works differently, meaning some women won’t feel the same positive effects as others, and women are notoriously deficient in magnesium. We can attribute most of the magnesium deficiency to “low dietary intake, depleted magnesium in our soil, modern stressors (stress depletes magnesium), carbonated beverages and coffee consumption, and a highly processed food, nutrient-poor diet.” Basically, the world is against us when it comes to getting the right amount of magnesium. On top of that, recent research shows that serum magnesium — the level of magnesium in the blood — actually decreases during the premenstrual week, meaning when you need it the most magnesium may be at its lowest levels. Even though the odds are against women when it comes to getting appropriate magnesium intake, now that we’re armed with knowledge, there’s a lot we can do to make sure we fix the issue in our own homes and our bodies. One of the best ways to get magnesium is through your food. Yet, as stated above, there are factors that we can’t control such as soil nutrition depletion. This is where local farmers and organic products reign supreme. For instance, this small farming operation in Central New York uses a supercharged soil called muck, which increases the nutrient richness of their foods. If you’ve got the room and time, one of the best sources of rich-nutrient plant-based foods is right in your back yard! Urban farming is one of the fastest growing trends as it allows you to be in complete control of your food product, from pesticides to adding nutrients to your soil. No matter how you incorporate them, here are a few plant-based sources that are rich in magnesium! I feel that I include avocado in almost every article I write! This plant-based food is truly a miracle source of so many vitamins (such as A, C, and K), minerals (such as calcium, potassium, and phosphorous), and healthy fats (such as monounsaturated, polyunsaturated, and saturated). When it comes to magnesium, avocado is one of my favorite sources. One cup of raw, pureed avocado offers up a whopping 66 milligrams of magnesium, almost a third of the recommended daily intake for most women (310 to 320). My mom always told me that bananas were a lifesaver during pregnancy, as they helped alleviate those horribly painful “charley horse” pregnancy cramps. These aren’t old wives’ tales! Bananas are a great plant-based source of magnesium. One cup of mashed, raw banana has a little over 60 milligrams of magnesium, as well as phosphorous, calcium, and potassium. Yet, it’s recommended to not go overboard with banana consumption (one a day is enough) due to the fact that that same cup of banana also has a little over 27 grams of sugar. Due to their natural sweetness, bananas are great eaten as a raw snack or added to natural plant-based breakfasts and desserts such as this Chia Oat Breakfast Bowl, these Chocolate Coffee Banana Muffins, or this super simple Banana Bread. Along with avocados, I don’t think I can go one article without mentioning the superpowers that leafy greens add to a nutritionally rich and balanced diet. When we say “leafy greens”, we’re talking about kale, spinach, collard greens, mustard greens, and turnip greens, to name just a few. Not only do leafy greens provide a wealth of vitamins and minerals that are lacking in many other plant-based sources (such as vitamin K and A, iron, zinc, and copper), but they are also rich in magnesium. Plus, you can amplify the amount of leafy green-sourced magnesium based on how you use these wonderful veggies. For example, one cup of raw chopped kale, which is perfect to add to an eggless omelet such as this Chickpea Omelet With Kale Filling and Cheesy Tahini Sauce, has 22 milligrams of magnesium, while one bunch of raw spinach, perfect for a large salad like this Buttery Spinach Salad With Tempeh and Crispy Shallots, has a whopping 269 milligrams of magnesium. Combine these two meals and you’ve already hit your magnesium recommended daily intake for women. Another great way to get that hit of magnesium during the worst days of your menstrual cycle is via supplements or used as a topical ointment. When going with a supplement, try to find one that is non-GMO, organic, vegetarian or vegan, and has few “fillers”. By following these rules you limit the synthetic materials you’re consuming along with that natural dose of magnesium. One of the best supplement brands that I have found is Garden of Life. 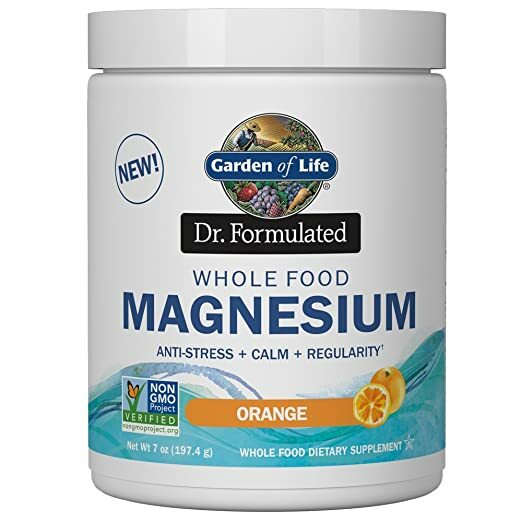 Their magnesium supplement, Garden of Life Dr. Formulated Whole Food Magnesium Supplement, is non-GMO project verified, vegan certified, gluten-free, sugar-free, and kosher. This one also provides live probiotics! Another great supplement is this NATURELO Magnesium Glycinate Supplement, which is made from plant-based magnesium sources (such as seeds, spinach, chard, okra, and quinoa), is non-GMO, gluten-free, soy-free, vegan, and contains zero coloring, flavoring, or preservatives. NATURELO also offers a 100 percent money back guarantee if it turns out not to be what you’re looking for! Lastly, you can also use a topical magnesium ointment. This is a great option for those that already suffer from digestive issues, especially during pre-menstruation and menstruation. Topical magnesium “bypasses the need to be digested,” providing relief directly through absorption through the skin. Plus, there’s a whole slew of products that are specifically designed with magnesium to target certain ailments such as this line of magnesium sprays from Seven Minerals including PMS Magnesium Relief Spray, Leg Cramp Relief Spray, or this Migraine and Headache Pain Relief Magnesium Essential Oil Spray. We also recommend that you check out 15 High-Quality Magnesium and Potassium Supplements for Better Health & Wellness! For more ways to integrate magnesium-rich foods into your plant-based diet, we highly recommend downloading our Food Monster App, which is available for both Android and iPhone, and can also be found on Instagram and Facebook. The app has more than 15,000 plant-based, allergy-friendly recipes, and subscribers gain access to new recipes every day. Check it out!